I think we have all had that night when we look into our fridge and cupboards and then turn to the family and say, “Let’s go get takeout,” simply because we can’t think of any quick and simple dinner ideas we can make with the ingredients we have on hand. If the family decides on fast food, you spend several minutes deciding where and 5 to 10 minutes rounding everyone up and getting them in the family vehicle. Or 5 to 10 minutes gathering everyone’s orders for drive thru. Finally a destination is picked or orders are gathered and your family spends another 5 to 10 or more minutes driving to the restaurant, another 5 minutes at least in the drive thru line and an additional 5 to 10 minutes driving home. If you opted to call for takeout instead, your family is still looking at waiting 30 minutes until you can pick it up. If you decided to splurge for delivery you might shave a few minutes off your wait, but then you have the added cost of a tip. Add that time up and you are spending at least 30 minutes of time for any takeout option you choose. Below are 20 different quick and simple dinner ideas made from basic ingredients. Chances are you could make at least 1 or 2 of these meals at any given time–and if not they should at least spark an idea of a quick and simple meal you can make with what you do have on hand. You might even want to use these ideas as a guide to making up a staple grocery list so that you can avoid the “there is nothing to eat” dilemma for good! Our family eats breakfast for dinner at least once a week. Now, I am not talking cereal here, but it could be if you wanted it to. I have a very close friend whose normal Sunday night family dinner is cold cereal. She started it when the children were small and it stuck. It is a way to make sure she gets a night off from cooking each week. Bacon or sausage and eggs with a side of whatever fruit you have in the house–fresh, frozen or canned. Pancakes, French toast, or waffles. Omelets using up whatever little bits of this and that you have in the fridge. We tend to eat from scratch cooking in our family 80% of the time, but I know that some nights we are just too busy or–let’s face it–too tired to cook even a simple meal from scratch so the number one way my family avoids takeout is keeping a few convenience meals on hand. A number of these items are the same items our kids would eat if we went to a fast food restaurant, but by buying them at the grocery store and making them at home we save money and time. The trick to having these types of food save you money, of course, is to set limits. Otherwise you start grabbing them every night, which is expensive and very unhealthy. Another quick pizza crust idea is to make it out of quick biscuit dough, either from scratch of out of the box Bisquick kind. Our family has also used tortillas, french bread sliced in half, bagels, bread, and even English muffins as the crust for a quick pizza. If you have a package or can of tuna or salmon a few crackers and an egg you have the ingredients for these fish patties that my family likes. (the recipe calls for lemon juice but I have made it without it several times and they taste just as good). You can also make tuna melts with bread tuna and cheese, or tuna casserole if you have a box of mac and cheese. You can also top a salad with tuna or salmon . Our family always has a few cans of ready-made soup on hand or a few packages of the kids favorite packaged chicken noodle soup. We usually also have bread in the freezer thanks to our discount bread store runs and some type of cheese in the house. Our favorite combination is tomato and roasted red pepper soup with grilled cheese sandwiches. However, we are happy with whatever we have in the cupboard and whatever sandwich makings we can find, even if it means that we are heating up 3 different types of soups to feed everyone. Pasta really isn’t that hard to cook and if you have a jar of pasta sauce in the cupboard and perhaps a bit of cheese to top it with, you have a good start to dinner. Dig around for some vegetables either canned, frozen, or fresh to round out the meal and perhaps some cheesy garlic toast. No jar of pasta? Here is a simple butter sauce recipe that you can alter using whatever spices or cheeses you have on hand. If you have cheese, milk, a bit of butter, and flour you can make a simple cheese sauce to mix in cooked pasta for a quick homemade mac and cheese. The recipe I use is similar to this one–don’t worry if you don’t have the dried mustard, it tastes fine without it and plain pepper will work as well as cayenne pepper, just add a bit more than the recipe calls for. Baked potatoes can be done in the microwave in much less time than the oven. Simply clean the skin of the potato, stick with a fork several times, and place on high for 2 to 3 minutes. Your potato may need more time if it is large. To check simply stick a fork in the potato. If the fork goes through, it is done. Top the potatoes with whatever you can find in the cupboards, fridge, and freezer. Use pizza sauce and Mozzarella for a pizza potato, taco meat and cheese for a taco potato, tuna and cheddar for a tuna melt potato, bacon and sour cream for a classic. The ideas go on and on. If you’re not a fan of baked potatoes, you can make homemade oven fries and top them with whatever you want to create your own version of loaded fries (psst…I never take the time to boil mine. I just wash the potatoes, cut them into wedges, rub them with oil and spices, and bake at 450 for about 20 to 30 minutes and they turn out fine). Boxed mac and cheese is so versatile. You can add in whatever stir ins you want and pour it all into a 9 by 12 pan and bake it for 15 to 20 minutes and end up with a great tasting casserole that feeds the whole family–or you can eat it as is with some healthy sides like fresh cut up vegetables or fruit. See a wide variety of Mac & Cheese recipes here for ideas to get your creative cooking side inspired. So chopped meat in gravy doesn’t sound that appetizing, but trust me–it tastes way better than it sounds. My family eats this basic meal several times a month. When ever I cook up chicken or turkey I chop up and freeze the leftovers in such a way that they make great add ins for meals. I will make a quick batch of from scratch gravy and mix meat in it –trust me, it is way easier to make gravy than you might think. Here is a link to a simple recipe similar to the one I use. psst…I use this instead of bullion cubes to make my chicken or beef broth, it cost a bit more, but in our family’s opinion the improved quality in flavor makes it worth every penny. We make chicken gravy when we have chicken or turkey on hand and beef gravy for leftover roast (which isn’t often as roast is a HUGE treat around our home). Usually we serve it with a side of potatoes and veggies, rice and veggies, or pour it over egg noodles with a side of veggies. As you can see it is very versatile. You could use the canned variety if that is what you have on hand, but homemade Sloppy Joe sauce is so much tastier and doesn’t take long to make, nor does it use complicated ingredients. Serve it over whatever you have on hand: bread, buns, even baked potatoes. If you have leftover rice in the fridge, a few eggs, and a few veggies (either fresh, cooked, canned, or frozen), plus a bit of soy sauce you have the makings of a good fried rice. Here is a simple recipe to use as a guide, don’t worry if you don’t have the exact ingredients. I just use olive oil, minced garlic from a jar, and use whatever veggies and meat we have on hand and it still turns out fine. A salad can turn into a quick and simple serve yourself dinner. Chop up lettuce or open the bag if that is the way you buy it and put it and all the toppings you can dig up on the table and let the salad creations begin. Gather nuts, seeds, leftover meats, sandwich meats, and canned meats such as tuna or salmon. Pull out all the cheese you can find. Even crushed chips such as tortilla chips can make a good salad topping. A simple dressing can be made from 1 tablespoon of Balsamic or apple cider vinegar, 2 tsp olive oil, a dash of pepper, and other spices you have on hand. For a munchy platter, almost everything in your cupboards is fair game. Generally around our home, these platters consist of lunch meat, crackers, fresh veggies, fresh fruit, pickles, cheese and whatever else we can find that is munch worthy. Taco filling does not have to be ground hamburger with taco seasoning. Chicken mixed with salsa works, as well as beans or lentils mixed with taco seasonings. Our family enjoys many different varieties of quesadillas. We usually use our waffle iron to make them. Our Family favorites is a pizza variety made with pepperoni and mozzarella cheese. We have also made them with just cheese when that is all we have had on hand. Chicken or beans mixed with cheese also makes a good filling. If you have cheese and a bag of tortilla chips, you have the makings for nachos. Of course, cheese on nachos is sort of plain. See if you can dig up some canned beans, olives, ground hamburger, or some other nacho worthy toppings if you can. If not, cheese on tortillas will do in a pinch. I like to keep a bag of frozen stir fry veggie mix on hand for our quick and simple dinner nights, but you don’t need one to enjoy a stir fry. If you can dig up at least 2 different veggies and some type of sauce, you have the makings of a stir fry. I use Italian dressing as a stir fry sauce in our family and try to serve it over rice if we have it. For protein you can add beans or whatever meat you have in the house. I have mentioned beans in a lot of these quick and simple dinner ideas already, but I also felt they needed a section all to themselves. A can of baked beans served with cheesy toast and whatever fruit and veggies you have a satisfying meal. You can also add in cut up hot dogs for a classic beans and weenies dish. Kielbasa can be served with sides or thrown in a lot of quick and simple meals. It heats up fast and is easy to keep in the freezer. We like kielbasa served with potatoes and–you guessed it–veggies (sorry, we are a plain and simple family). Throw cooked and cut up kielbasa in a can of baked beans for a twist on beans and weenies. Some nights when I am too tired to cook, I dive deep into the fridge and pull out all the leftovers that are still safe to eat (occasionally a container of something will get past me for too long). I put out plates and call the family into the kitchen and call dibs. Now, my kids are all teenagers so they can fix their own plates. If you have smaller children, you might want to just divide it all up evenly and reheat it before serving them. Sometimes I do have to add to these leftovers to make a meal for everyone. That might be putting in a pan of cheesy toast or digging down deep in the freezer for something we can add as a side dish to what we have. A successful leftover night boils down to great out of the box thinking. Actually, the key to any quick and simple dinner meal is out of the box thinking. You need to look at what you have with creative eyes. You have to think beyond what you see to what it could potentially become. You also have to push through tired by thinking logically. 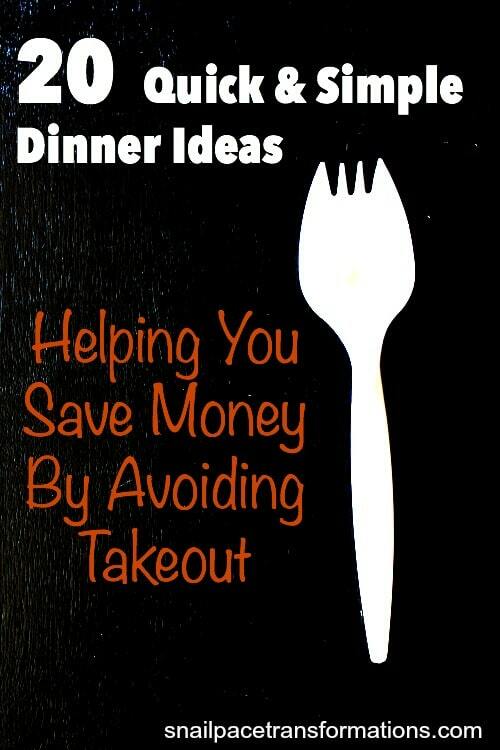 Going out for takeout not only blows you budget but it really isn’t the time saver we tend to think it is. Plus, you can’t eat out in your PJ’s, but you can make dinner in them if you want! That is a HUGE bonus for staying home (well, at least it is for me). Share your favorite quick and simple dinner ideas with me in the comments below! Follow Victoria @Snail Pace Transformations’s board Main Dish Recipes on Pinterest.